How to draw and paint Mongol Khan. Learn to draw and paint a Mongol Khan from a free video lesson and step by step images tutorial. 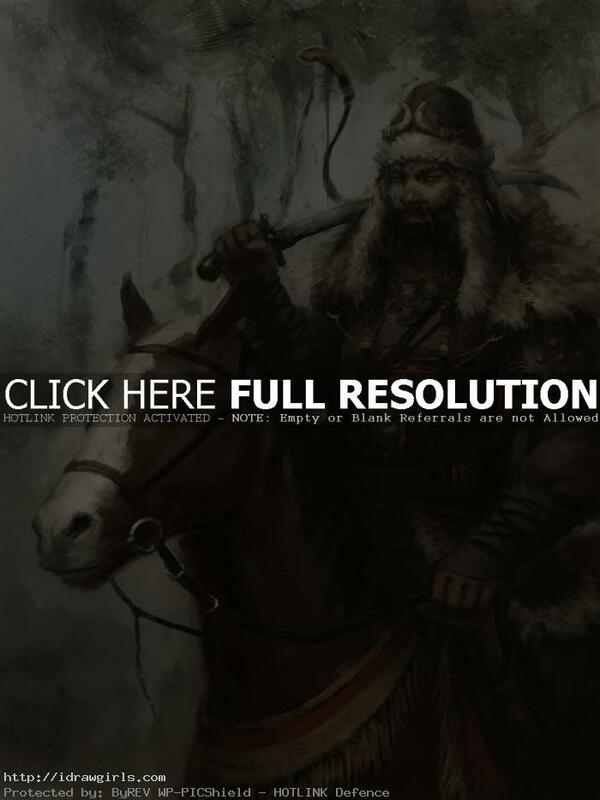 In this tutorial you will learn how to paint a Mongol Khan character, armor, and fur. You will also learn how to paint horse and weapons. This tutorial demonstrate mostly how to paint fur. I decided to have a Mongol warrior character to demo because their armor and gears has a lot of fur on them. Other than painting fur, I will also include a bit of leather, cloth and skin in this step by step digital painting Mongol warrior. I eventually get some time to finish this piece from previous post, Yesugei character concept work. Yesügei the Mongol warrior Khan was chief of the Blue Wolf clan and the father of Temüjin (Genghis Khan). Yesügei’s wife was Hoelun (Temujin’s mother), a daughter of the Olkhunut forest tribe. Hoelun had been abducted by Yesügei and his brothers from her newly wed husband of the Merkit tribe as she and her husband were traveling back to the Merkit camp. There are a few more digital painting tutorial that are similar to this one. If you are interested in the same digital painting style, you can go watch more video tutorials here; How to draw Tatar warrior and How to draw Mongol warrior. Also if you just want to take a look at some male basic anatomy tutorial to supplement the Thor tutorial, go watch How to draw man’s body torso muscles video and step by step and Drawing arm muscles bicep tricep video. Both are useful for studying muscles and human anatomy for artist. Here is a final character design of Mongol Khan. Watch an art lesson video tutorial on how to paint tips and technique, part of Mongol Khan’s armor. Below are step by step how to draw Mongol Khan. Step one, I sketched roughly his whole body with armor and helmet, then a horse. After that, I filled the whole figure, including the horse with medium gray. Step two, I applied some of loose detail with color. Notice that it is still very monochromatic in sepia tone. Step three, I tighten up his face with more detail. At this point, I just focus on light and shadow on the key elements such as his beard, fur, and armor, but the rest of them still be very loose drawing. Then step by step process, how to paint Mongol Khan. Step four, now I got close up on his face and painted his eyes, nose and tighten up the painting on his armor. Step five, I changed the position of his right arm by having it holding a weapon. I also clean up the painting to make it more tight, but not too tight. Step six, final detailing on the fur on his armor and helmet, then texture on metal part. Tips, focus on light and shadow on how it interacts with light. It is all about lighting. Then we are done! You can get to see my process in more detail about two hours long from any of the Premium tutorial. They have very similar process. Hope this helps.